There aren't many hotels in Kalasin. Since this review I've discovered Phaiboon Place, which has some good feedback. it's much newer than the Rimpao but the Rimpao is close to my wife's home so we tend to stay there. You'll have to excuse the the lack of room pictures in this review. I didn't have time, so you will have to take my word on that aspect of this review until I grab some more on my next visit. 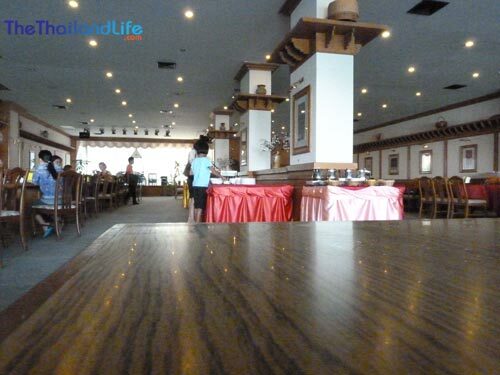 Situated about 10 minutes drive from the centre of town, the Rimpao Hotel is very well located. 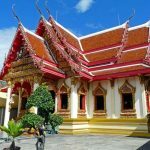 You might argue it could be closer to Kalasin centre, but then you have shops close by if you need them and there isn’t anything I can think of in the town you will need to be close to, unless people you are visiting need you to be there. There is a massive Tesco that is walkable from the hotel too. And if you drive 5 minutes down the road to Baan Koksri there is a Tesco Express. You'll more than likely be travelling in a car to local places of interest, and the hotel is nicely situated on the major road you'll need to join to get to surrounding towns. The rate on the website is the rate you will get at the desk, 1,000 Baht for a single room, 1,100 for a twin room, which means 2 beds NOT pushed together. You'll need to upgrade to the suite for the luxury of a double bed, which is 4,000 Baht per night – I wasn’t paying that for a rural hotel with 70s’ décor. The price does include breakfast. Checkout is 2pm, which suits me nicely and is something I wish city-based hotels would implement instead of the 10am/12pm standard. 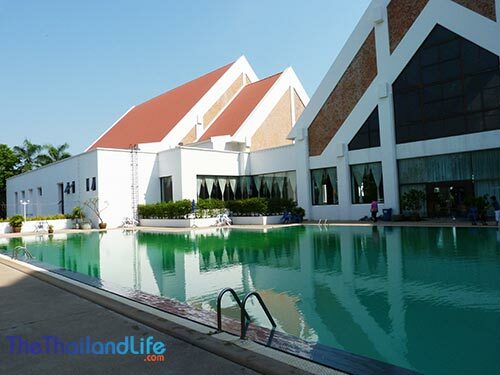 The Rimpao Hotel is set in large grounds with pretty trees and well kept green areas. You enter the grounds over a small bridge, under which runs a quaint but sometimes dry river. It looks very grand as you roll up, and the imposing building is an unexpected architectural treat. One thing you'll notice immediately is how well kept everything is and how well presented and spacious the grounds feels. A simple walk around or even a chill on the steps outside the hotel is in itself a very peaceful outing. The lobby is lovely. It's huge and adorned with classic furniture. The design keeps it lovely and cool, which is perfect for sitting down reading a paper or answering some emails. The lobby has two computers for guests in case you don't have your laptop. 70s’ looking it might be, but the room certainly was clean. The huge window bay offered a beautiful view of the pool in the morning too – make sure you request a pool-facing room as the other side isn't much to look at. The bed was firm, and I must say, for someone that doesn’t often sleep well in hotels, I slept like a baby. You get a full UBC package showing international football, films and soaps, a minibar with very reasonably priced drinks and room service up until 12am, carrying a broad selection of meals and snacks. The bathroom was clean and the shower very powerful – take care in getting the right temperature before you jump in, the hot water is very hot! You also have a deep bath for a long-soak after a day out in the sun. You can pretty much have the same food for lunch as dinner. I had mixed vegetables with tofu and steamed rice for lunch and dinner twice (non-meat eater). That said, in truth the Thai food wasn’t all that impressive. if you're looking for the real deal I would venture out to a roadside gaff or go into town. The dining room is made very pleasant in the evening with entertainment from local singers singing Isaan and Thai songs. Perhaps the best treat of all was that they sell Campari! Always a nice evening tipple. As I said, the singers in the dining room were pretty good, and their enthusiasm certainly deserves a pay rise. I was one of about seven people in there on a peak night and they still put on a good show. There's a disco venue on site that runs throughout the year, which will come as a blessing for some considering Kalasin doesn’t have much in the way of nightlife (closed at present). There's also a massage service downstairs and a poolroom and bar. The pool is well worthy of its own section in this review because of its epic size. Complete with a smaller pool sectioned off for kids, the Olympic, or thereabouts, sized pool is clean and surrounded by pleasant trees, plants and tables to lounge on. 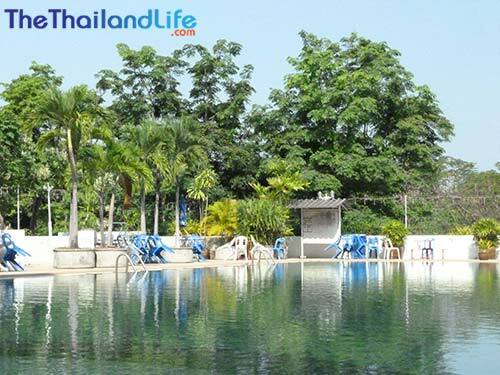 I really was shocked by the size of the pool, and boy do you have the weather in April for swimming in Isaan. The pool, along with the traditional north eastern decor in the lobby, is the standout feature of the hotel. It's a real rare find up these parts and something a number locals pay to use after 4pm. Absolutely no complaints on this front. The reception staff is very friendly and all have a decent command of English. The porters were helpful and the restaurant staff extremely pleasant. What the hotel lacks slightly in modernity it certainly makes up for in smiles and great service. All in all I had a great stay at the Rimpao Hotel, and I will certainly stay there again. 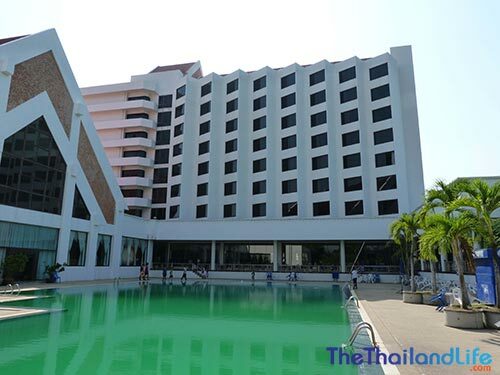 The location is great, the service is good, it's a nice place to chill, and unless a brand new hotel with a rival pool is built in the future, I won't be scouting out alternative accommodation when visiting Kalasin again. If the Rimpao upgraded the breakfast slightly, perhaps added in some cereal options, brown bread and other bits n bobs, and perhaps carried out a slight refurbishment on the room and corridor décor, the place would really benefit. But it's not bad and nothing annoyed me about the hotel. One must also consider that they probably don’t get anywhere near as busy as a big city hotel, and therefore I doubt if the budget permits much renovation. The price of the standard rooms is fair, but the bigger rooms are way too expensive in my opinion. The hotel is a great asset to a beautiful town full of wonderful people. I am a fussy fellow when it comes to hotels, yet I was pleasantly surprised to find a hotel like this in a small north eastern town. This is not a 5 star hotel. The place is clean cheap and cheerful. For 1100 a night you can't complain. But don't come to Kalasin for the nightlife, come for the culture. I don't know where you come from but if you think the Rimpao Hotel is good, then you need to wake up, and there is no way you even know the meaning of the word fussy. The lobby of the Rimpao looks OK but as soon as you step into the lift you are in another world. The rooms are grubby and depressing and all have strong cigarette smoke smell. Ceilings in some rooms and most of the hallways are black with mould from the leaking air conditioner ducts.The dining room is boring and mostly empty,and the breakfast is poor. You can read more on my review on Trip Advisor written soon after my visit. I am from the UK and have stayed in hotels all over the world. From the Sheraton's and Hilton's right down to the Rimpao in Kalasin. Yes the hotel is aging, but both times I have stayed there I have enjoyed myself more than many of the plush hotels I have been in. I didn't see any mold, neither did my room smell of smoke - if it had I would've requested a move. The dining room fine. Okay, the entertainment in the evening is a little Butlins-like but there are hardly ever any guests. 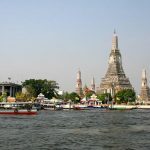 If you want nightlife stay in Bangkok. Anyway, the dining room is for eating and the food is fine, not amazing but the selection is enough for me. 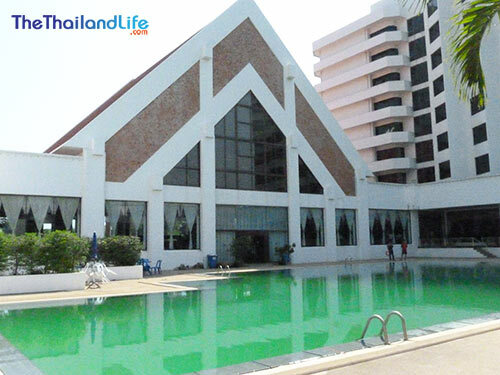 The swimming pool is huge and provides ample entertainment for kids. The grounds are beautiful and the staff extremely nice. For 20 GBP per night what more do you want? To be fair, the hotel could do with the rooms and hallways being updated, but then when you think that the hotel is rarely a quarter full, I doubt they have a spare 100,000 quid to do it up. Moreover, this is quaint Kalasin in the middle of Isaan. It isn't a tourist hotspot and frankly I am so pleased I am able to get a decent bed for the night, with a decent breakfast, with a swim and a great staff to take care of me when I am there. You always have the alternative of renting a bungalow or squatting down on the floor with some locals :) Personally, i am up and out early visting family and friends and taking in the serenity...no time for grumbling over minor details when there is nature to be admired. Let go and enjoy! Internet has worked okay for me on the two occasions I stayed. 6th floor and 8th floor. Although you have to buy login cards at 50baht an hour.